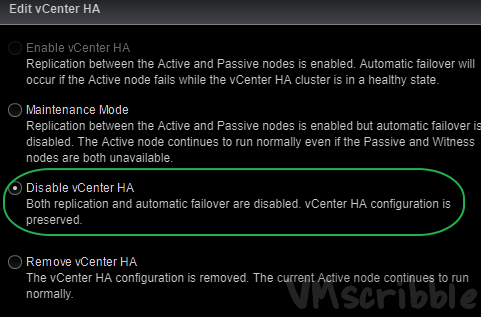 Please disable “vCenter HA” before executing the script. Login to the FLEX client and Disable VCHA. Maintenance Mode VCHA – Same error. cat /var/log/vmware/vSphere-TlsReconfigurator/VcTlsReconfigurator.log does not show any useful information. 2018-11-24T21:46:49.785Z INFO Log file: “/var/log/vmware/vSphere-TlsReconfigurator/VcTlsReconfigurator.log”. 2018-11-24T21:46:50.068Z ERROR Please disable “vCenter HA” before executing the script. 2018-11-24T21:51:43.137Z INFO Log file: “/var/log/vmware/vSphere-TlsReconfigurator/VcTlsReconfigurator.log”. 2018-11-24T21:51:43.235Z ERROR Please disable “vCenter HA” before executing the script. Remove VCHA aka Destroy the vCenter HA Cluster.